The Oxford Film Festival is pleased to partner with The Lyric Oxford to bring the brand-new (dairy-fresh!) concert film, R.E.M. : THIS IS NOT A SHOW, for a one-time screening. 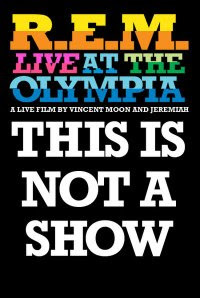 The film chronicles the band's “working rehearsals” at Dublin's Olympia Theatre in 2007, where they played classics (These Days, Cuyahoga, So. Central Rain) and tested then-new material (from ACCELERATE) over five nights before sold-out crowds. "R.E.M. 's music is ... the soundtrack to your life" -- actually, this is true, at least for me.